A college student from Florida has a harrowing tale to tell. 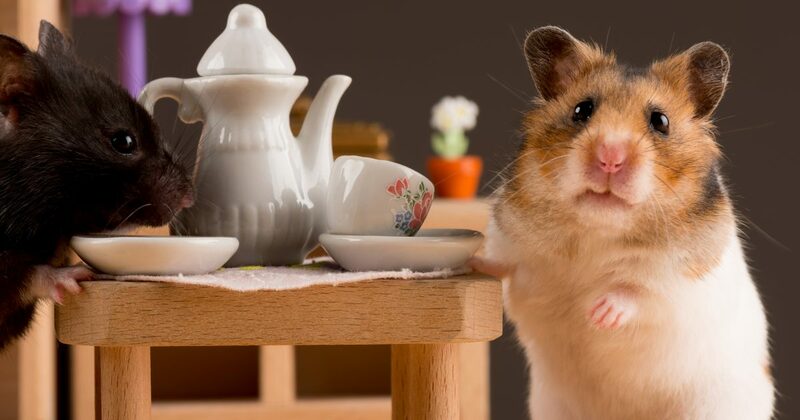 Belen Aldecosea says she ran into trouble when she attempted to board a Spirit Airlines flight with her emotional support hamster, Pebbles. It seems that Spirit has a policy forbidding rodents from flying in the main cabin with actual human beings, even if they are the sort of rodents who provide emotional support to the sort of people who need emotional support from rodents. Belen was in a bind. Forced to decide between forgoing the flight or forgoing her beloved hamster — the hamster that she claims she needs — she decided to flush poor Pebbles down the toilet. Belen, of course, blames Spirit Airlines for all of this. But Pebbles, if she could speak from her watery grave, would probably blame the madwoman who drowned her in the bathroom. This news comes only days after another passenger of questionable sanity tried to board a United Airlines flight with an emotional support peacock. She was also turned away. I’m not sure if she flushed the peacock down the toilet. Now, I support anyone’s right to use a service animal if they have a legitimate disability. But an emotional support animal isn’t a service animal any more than a skateboard is a wheelchair. You may find “comfort” in your rat or your bird or your pig or your llama, but you can’t turn an airplane into a flying zoo just because it makes you comfortable. Your comfort is not the concern of everyone else, and the rest of us are significantly less comfortable when forced to share our accommodations with a bunch of non-human critters. A blind man who uses a service dog is being reasonable and asking the rest of us to make a reasonable concession for his sake. A college student who carries her rodent around like a purse is being selfish and demanding that the rest of us acquiesce to her selfishness. This, anyway, seems to be the analysis of most critics of the emotional support animal epidemic. They say that these people are self-centered and immature, and the whole thing is just another symptom of the increasing infantilization of American culture. It is that, to be sure. It’s also, we should note, dishonesty. A woman who pretends her favorite pet is a service animal can be considered no better than a woman who pretends to be wheelchair-bound so that she can go to the front of the line at Disney World. For some reason we don’t treat the emotional support animal scam with the same contempt that we treat a car illegally parked in a handicap spot, but we should. It’s immoral as well as annoying and childish. But I think the problem runs deeper. What lies at the root of the emotional support animal invention is the increasing humanization of animals in western society. A person who insists on bringing their animal everywhere suffers from the delusion that his animal is basically another person and deserves to be treated as such. It’s no surprise that people would develop this bizarre idea in a country where we take our pets to spas and buy alcohol-free wine for our dogs and overall spend **69 billion dollars a year** feeding and pampering our animals. In our culture, we tend to empathize more with animals than our fellow human beings, and many in my generation prefer the company of lesser creatures so much that they’ve decided to have pets rather than kids. Of course that’s not nearly as sick and deranged as the large share of parents who have both pets and kids, and consider their “fur children” and their real children to be equal. In fact, many Americans prefer to spend time with their pets than their spouses. It seems, given the choice, a certain percentage of parents would rather stow the baby in a cage below deck and bring the dog on board. Years from now, historians will look at our culture’s devolution into pet worship and write many volumes attempting to diagnose it. But I think the cause is quite clear, and has already been mentioned above: selfishness. To love another human being is to sacrifice. It is to come out of yourself and put someone else’s needs above your own. To love a child or a spouse is to serve, to give. Modern man is not willing or able to forget himself or put anyone higher than himself, so he targets his affections toward his gerbil or his poodle instead. That way he can feel like he’s “loving” something without actually having to do anything or change his life in any significant way. But it’s not really love. Yes, some people do love their pets, and love them in a healthy way, by loving them in accordance with the natural order of things. But people who love their pets more than they love people don’t actually love pets at all. They don’t love anything. More precisely, what they love about the pet is what it does for them and how it makes them feel. They love themselves through their pets. The animal is a blank slate that the loveless modern man can turn into a little avatar of himself. He worships his dog because his dog worships him. People are more complicated. They will not lie at your feet. They will not slobber over you. They will not sit there to be rubbed or cuddled as long as you wish. They are not accessories that you can carry around for “emotional support.” Their needs are more complex. It is work to love them, and it involves an emotional risk. This is all too much for a selfish person so he retreats to the lesser, simpler, self-centered “love” of his cat or his parrot. And, as I’ve found, he’s often pretty straightforward about his selfish motivations.